Two of my favorite fast food joints, the Caribbean-influenced Golden Krust and the gargantuan’s of grease, Checkers, got married and had a beautiful burger baby. 1. 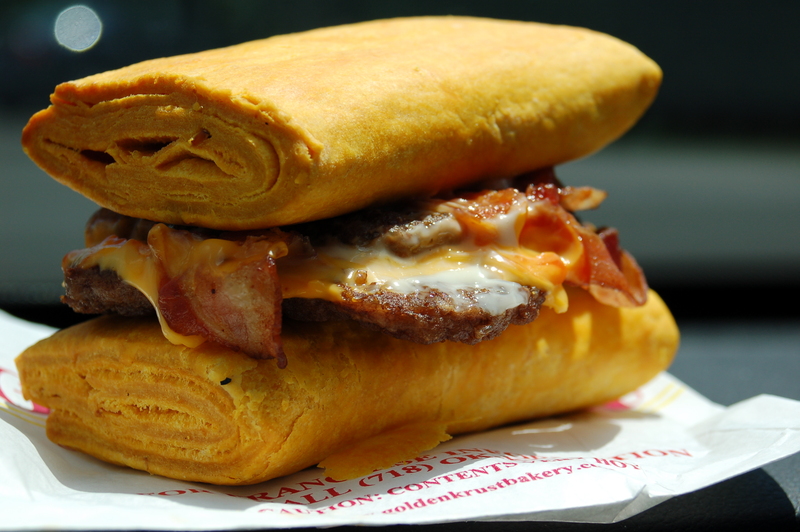 Flip your “Baconzilla” over and remove bottom bun, replacing it with one of the “Krust” pastries. Like a Rastafarian cousin of the legendary Luther Burger (a bacon cheeseburger served on a Krispy Kreme donut) with a bit more heft. Perfectly stratified layers of sweet, salty and savory. Ensuring that the burger and pastries are warm is key which means that you will need to identify a Golden Krust and Checkers in close proximity to each other. Thankfully in Philadelphia this is not that difficult. The easiest spot to pull this off is in North Philadelphia near the Olney Septa Terminal (pick up your Golden Krust at Broad & Olney and then drive 2 minutes further north to the Checkers at 5600 North Broad Street). You can also grab your GK just up the street from the Tower Theater in Upper Darby and then grab the Baconzilla at the Checkers at Lancaster and W. Girard). Not in Philadelphia? Check out each joint’s webpage for locations – Golden Krust – Checkers/Rally’s. Although tall in stature, the concoction does press down nicely and despite appearances is not unwieldy to eat except for the flakiness of the “bun.” Eating one is shame-inducing (a la KFC’s Double Down), but you only go around this world once so you may as well give it a try. The “Krust” alone is a decadent item, with an amped up taste no doubt owing to some shortening, and mouthfeel akin to baklava. 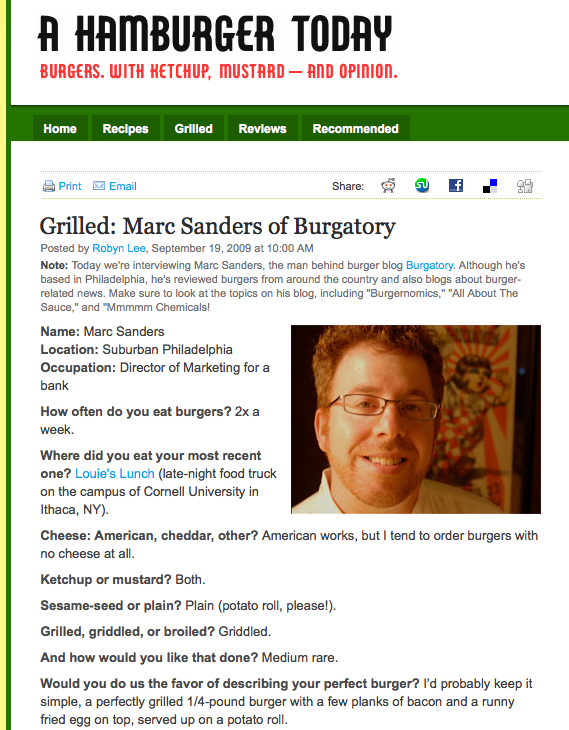 As previously noted in this blog, the “Baconzilla” is in my mind, the undisputed heavyweight champion of fast food burgers. A mind-altering melange of turbo charged beef, as much bacon as the preparer either feels like or remembers to put on, an equally random amount of cheddar cheese sauce all topped with ketchup and mayonnaise. Normally served on a perfectly acceptable fancied up burger bun (think Wendy’s larger burgers if you don’t have a Checkers near you), the “Baconzilla” lives up to its monster themed name. The grilled cheese sandwich leftover in the “Baconzilla” bun is a worthwhile meal in itself. The remaining cheese mixes perfectly with the leftover ketchup and mayo to create an oozy, cheese whiz-esque neon orange sauce. This is truly inspired. You are a wicked genius. Thanks Joe. Lots of new content coming down the pike, too! Just the pastry and not the patty? Tsk, tsk. Dig the new design, by the way. Looks great! Similar, in a way, mainly appearance, but far more traditional and oh how I miss it so very much!!!!!!!!!! A San Francisco sourdough roll. A unique taste discussed over the years. Believed traceable to the yeast used for the local sourdough bread traceable to before the advent of the 1900s. Atop that unique-tasting roll, still warm and soft, Red’s Java House at the foot of the Oakland Bay Bridge, the San Francisco side, would then toss atop the roll a couple grilled beef patties, couple cheese slices, and, to sate my demands, some mayo, onion and lettuce. Nuthin’ truly special but decent quality meat and those special-tasting rolls made the burger special. I can easily conceptualize how your inclusion of a unique roll-type led to your posting about the unique concoction.